Min-Y-Don Holiday Home & Touring Park01766 780286work Holiday Home ParkThe Min-y-Don Holiday Home & Touring Park is located on a beautiful stretch of coastline providing a superb holiday setting for all. The park is uniquely situated below Harlech Castle and the bustling town is only a pleasant walk away. The Park offers peace and tranquility on a level land site and offers many facilities to make your stay as comfortable as possible. The superb new facilities include a toilet block with toilets, wash hand basins, showers, full disabled facilities, laundry and dishwashing room together with private bathrooms. Sorry, no camping pitches. The Min-y-Don Holiday Home & Touring Park is located on a beautiful stretch of coastline providing a superb holiday setting for all. 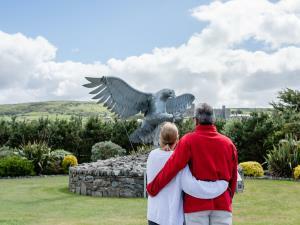 The park is uniquely situated below Harlech Castle and the bustling town is only a pleasant walk away.